Pitcairn has always relied on shipping as its lifeline for survival because of its isolation. 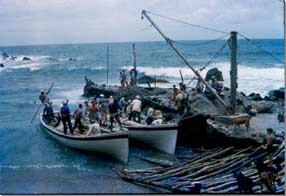 Everything not produced on Pitcairn arrives by sea and is shipped ashore. In 1819 Captain Henry King donated a boat to the Island and in 1880 Queen Victoria gifted two whaleboats. The longboats of Pitcairn are reputed to be modelled on this whaleboat pattern. Over time the boats have been modified and enlarged but essentially retain the same look. The Pitcairners built their own boats and up until the 1980s the boats were made of wood. The last boat was made in 1983 and retired in 1995 when it was replaced with a New Zealand made aluminium boat. “Then began the procession downhill, led by the blue tractor pulling the boat and the red tractor acting as a brake and ‘nudger’. For once we were grateful for our clay roads as they were not too hard on the bottom of the sliding boat. After more muscle work, the boat was in the metal channel of the slipway and with a final heave she was launched. A quick check revealed there were only a few minor leaks. Oars were grabbed and the lads were ready to go for a row out of the harbour. The old-timers scratched their heads in disbelief at the lack of oarsmanship displayed by the younger members of the community, a heritage of the motor boat era….. She certainly road the seas well and the boat lived up to expectations “. Pitcairn currently uses 2 aluminium boats built to the Islanders specifications and named “Tub”, and “Moss”. Each is around 13 metres in length and can carry up to 10 tonnes of cargo at any one time. “Tin” is a smaller third vessel but is rarely used. They are powered by inboard diesel engines and are used primarily to offload supplies from visiting supply ships and to take the locals and their souvenir products to visiting cruise liners and to bring visitors to Bounty Bay. Exiting and entering the harbour at the Landing can be extremely dangerous and requires great skill and experience. In rough seas especially it is crucial that the right time is chosen to enter the harbour. 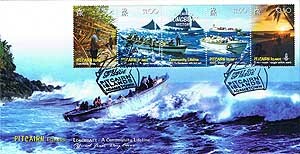 Other uses for the longboats are for fishing and for visiting the islands of Oeno and Henderson. From timber framed vessels to tough aluminium workhorses, the Longboats of the Pitcairn Islands provide that much needed community lifeline. Photography: Thanks go to Pawl Warren, Betty Christian and the Pitcairn Islands Study Centre. Format: Setenant strips of 4 vert.stamps with centre tab. Sheet Configuration: 6 strips per sheet, 2 x panes of 3 strips each. 24 April 2008 for a period of 2 years.